Today’s product review has been one in the making since the beginning of the school year! I just had to take my time and really get into it so I could share all the details with you in full! 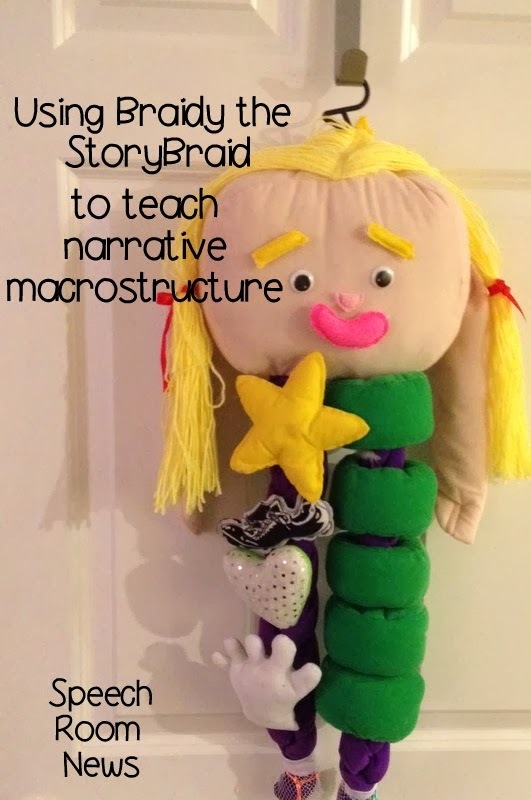 Braidy, the StoryBraid is a tool developed for narrative development. This post will be a bit long, but worth it if you hang in there! Before I even start, I have to tell you that I had dozens of pictures to share of my kids using Braidy. The bad news is my phone went bye-bye and I lost them. So these others will have to do! If you’re following me on Instagram you will see them organically pop up from time to time during the rest of the year. Back in September, I shared a review of the Story Grammar Marker App. Today, Braidy the Story Braid is my focus. The Story Grammar Marker is the foundation for Braidy the Story Braid, so let’s start there with a quick summary. 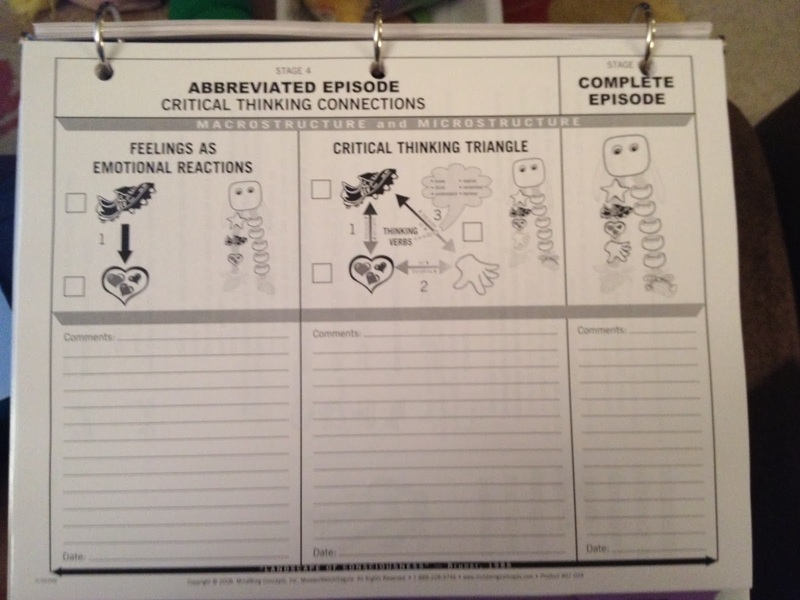 “The SGM® incorporates MindWing’s patented icons to give children a visual, kinesthetic tool for help with “WH” Story Grammar questions and common graphic organizers. 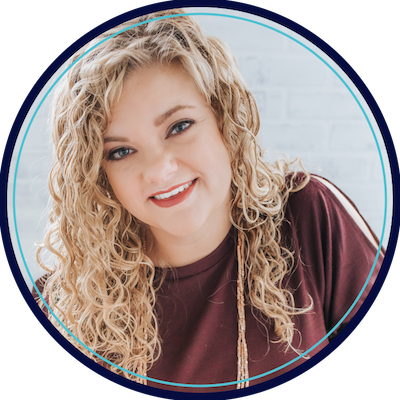 The SGM® delves into the “why” question: motivations, feelings, plans – all necessary for the development of critical thinking skills. This colorful, hands-on tool enables children to externalize the macrostructure of the story so they can concentrate on literate language features (microstructure). What makes MindWing’s methodology so unique and child-friendly are MindWing’s visual, kinesthetic, tactile tools which are comprised of a series of patented icons that are colorful and meaningful. MindWing’s tools are three dimensional, non-linguistic representations of narrative and expository structures. 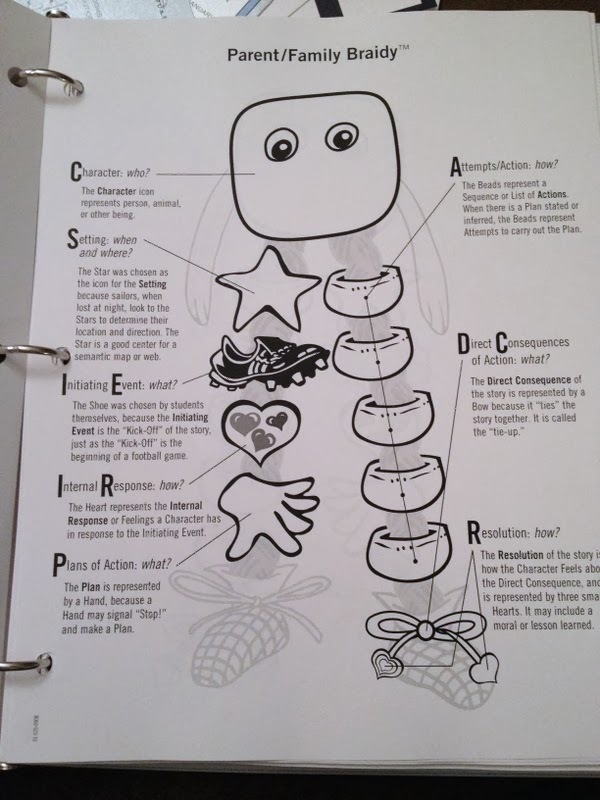 Children can see, touch and move these icons to cue them for the “Wh” questions about stories and help them to recognize text structures in content area selections.” I had to directly quote their website because I couldn’t think of a way to say it better myself! Ok, so Let’s get back to Braidy! Story Grammar Marker is developed for school aged children, while the StoryBraid is developed for preschool to first grade children. 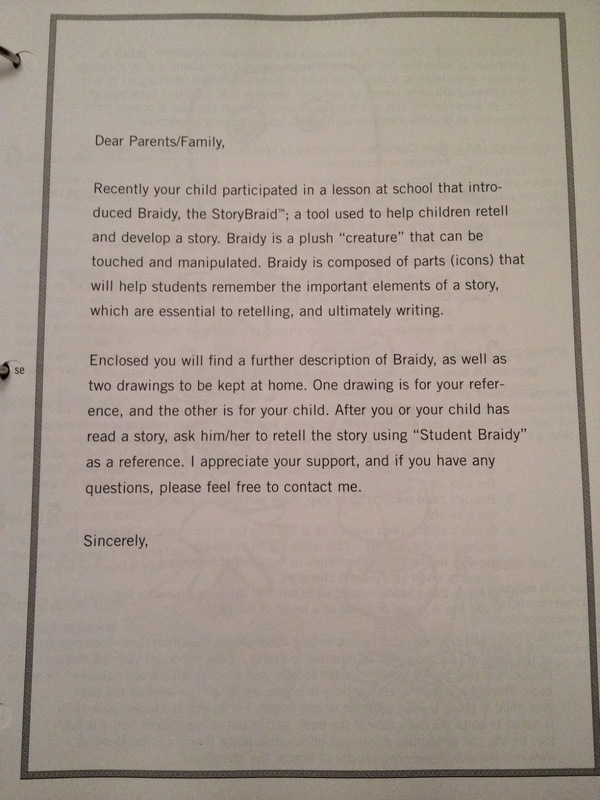 The story braid was designed to look like a child’s drawing of a person. 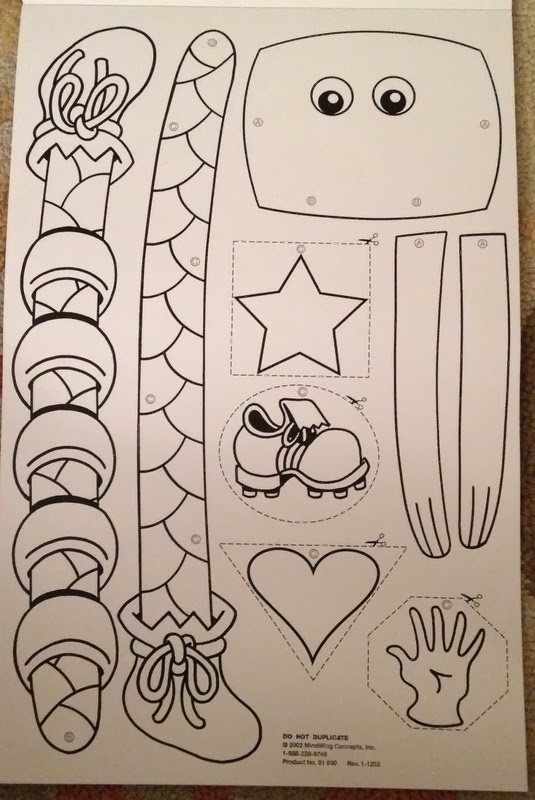 Each part of the design stands for different story element. The head represents the character of the story. You can change the head’s decorations to be a boy or girl. You can also make it a dog or rabbit. Each of the pieces is easily changed with velcro. The leg braids represent the 6 strands of language. The star is the setting, the shoe is the kickoff, the heart represents the feelings or internal response, and the glove represents the plan. On the other strand there are 5 green rings corresponding to the moveable action sequence. Braidy and SGM both look at literacy through macrostructure and microstructure of language. 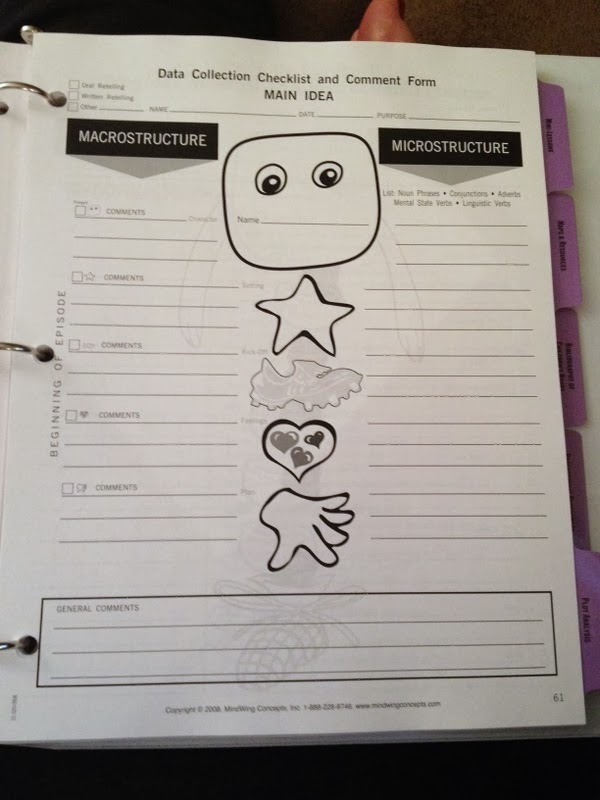 The macrostructure is the child’s ability to understand and tell a story using facts and information. The macrostructure is the focus of Braidy, the StoryBraid. Microstructure pertains to sentence formation and cohesion which is a higher order skill. The manual includes detailed instructions on the ways to use Braidy. I love the parent letters. It’s such a time saver! 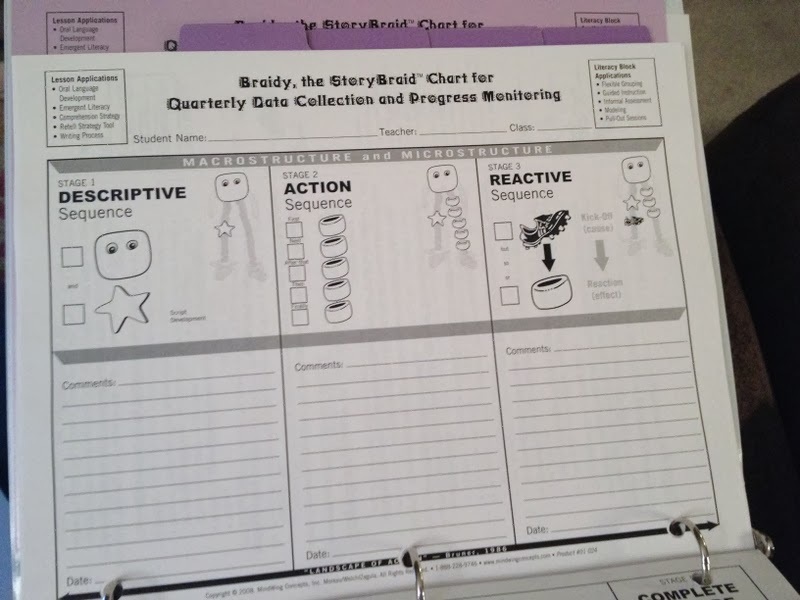 The manual details the stages of narrative development. These move from the first simple sentences to more detailed complete episodes. 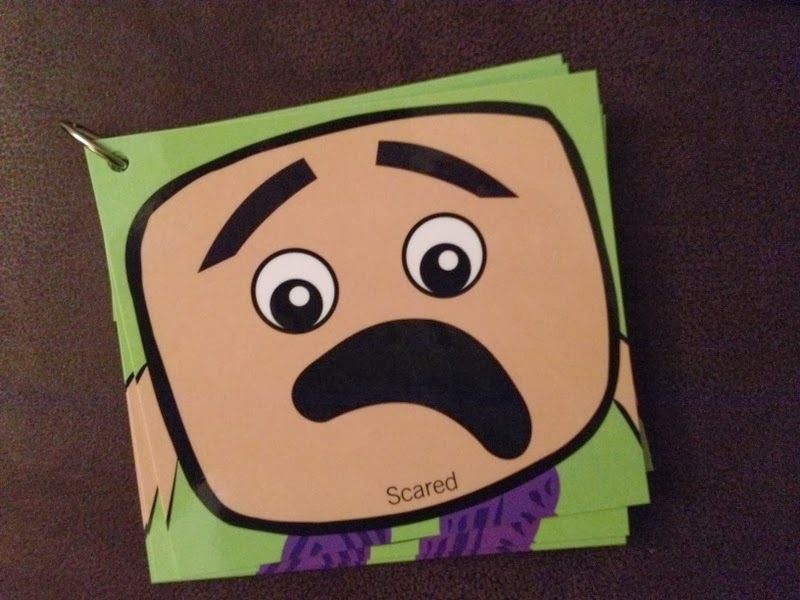 Stage 1 is typically expected of 3-4 year olds and includes a simple story that labels the characters and the actions (ie: Me and mommy goed to the big mall.) A complete episode would be expected in stage 5 at around 7-8 years old. In this stage, the child tells a complete episode containing a variety of cohesive ties. This includes character, setting, initiating events, internal response (feelings), plans, attempts, direct consequences, and resolution. 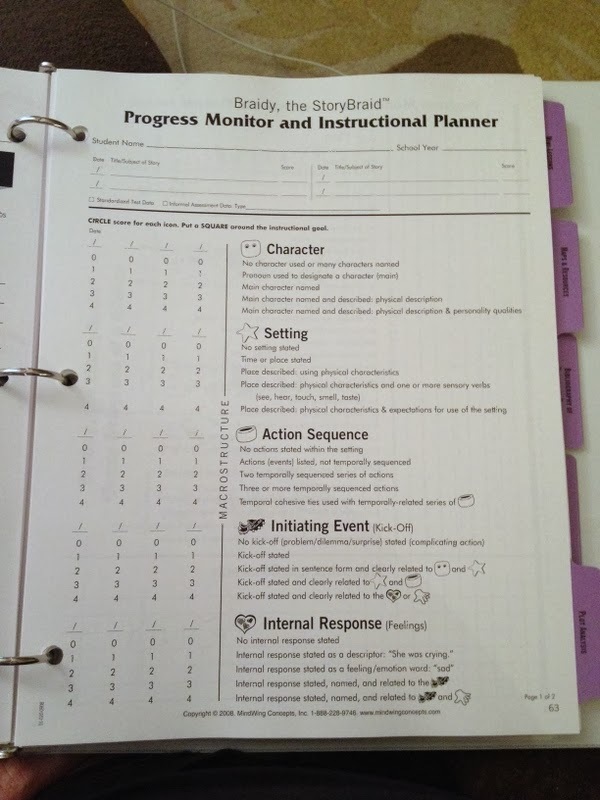 The manual includes several data collection and progress monitoring sheets. 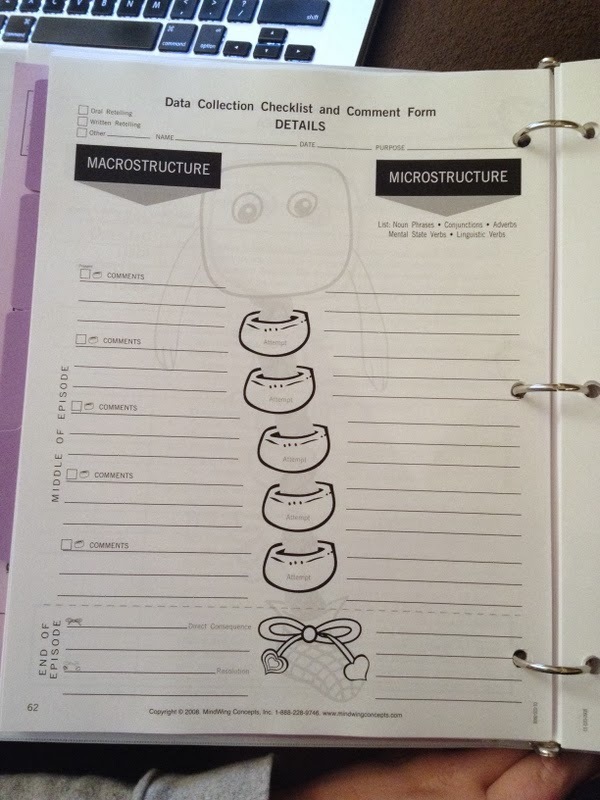 So you have the multi-sensory braid, data sheets, and parent letter, what next? 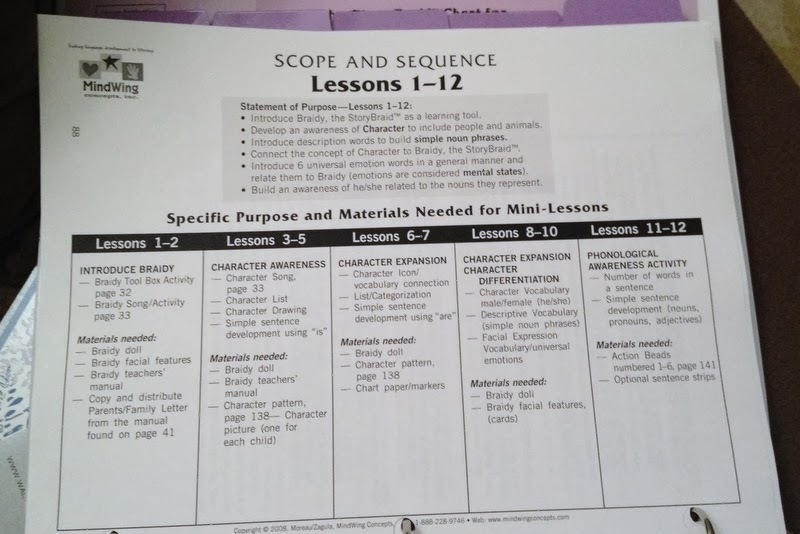 The manual also includes mini-lessons that outline a flexible but systematic instructional sequence to work on oral language skill. These lessons are designed to help increase your students’ discourse level of language development. These lessons (70 in total) start with the introduction of Braidy. Then move through specific elements of macrostructure such as characters, settings, and comparing/contrasting story elements. So now you’re ready to use some real children’s literature in your lesson. Refer to the bibliography of children’s literature to pick books to match each stage of narrative development. 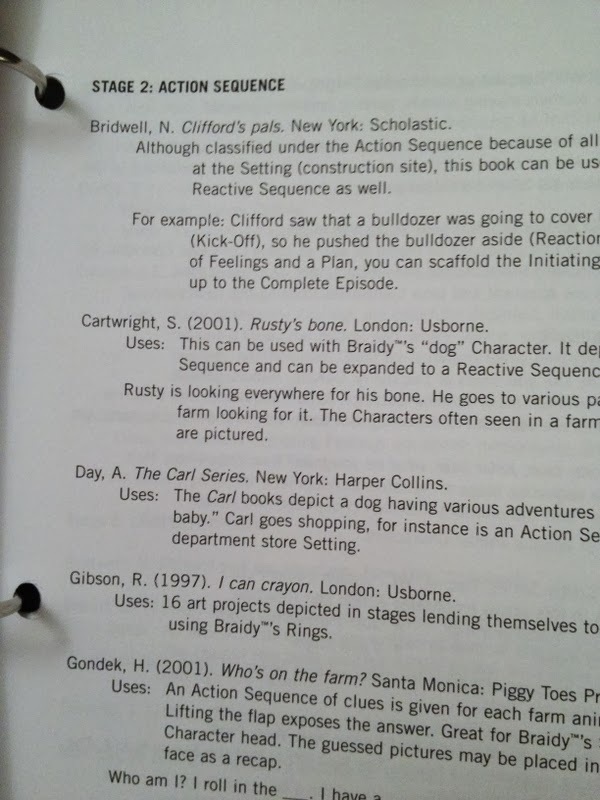 For example, a Clifford book can be used to work on action sequence. 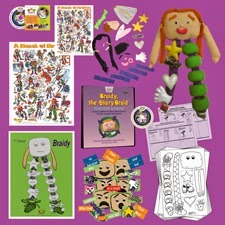 Braidy’s package also included posters, emotions cards, and a make your own Braidy set. After working with the StoryBraid, I’m really hoping to make it to one of their workshops! Here a little video I found on the MindWings YouTube site if you’d like to check it out! My favorite thing about the Braidy set is the depth of the product. 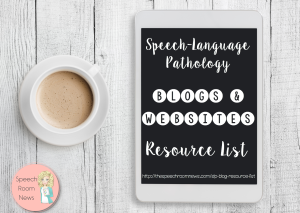 An SLP really gets everything they need to instruct their student. 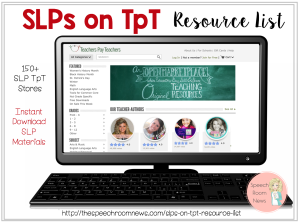 You can tell that this product has been around for many years, as the manual is fully developed and seems to support the SLP from beginning to end. Braidy, the Story Braid is available on the MindWings Concepts website for $195. Have you used the StoryBraid before? Thoughts? Opinions? Disclaimer: MindWings Concepts provided me with a copy of their product for review. No other compensation was provided. The opinions expressed are solely mine. I am trying to convince my district to buy SGM, is the manual in the kit thats $195 all encompassing. We are trying to figure out if we should ask for the $195 kit or the biggg kit thats like $800.